“The Scriptures, given under the guidance of the Holy Spirit, are nevertheless the words of men, conditioned by the language, thought forms, and literary fashions of the place and times at which they were written. They reflect the view of life, history, and the cosmos which were then current. The church, therefore, has an obligation to approach the Scriptures with a literary and historical understanding. As God has spoken his word in diverse cultural situations, the church is confident that he will continue to speak through the Scriptures in a changing world and in every form of human culture” (257). The foregoing paragraph contains some very subtle implications. It reflects what is known as the “historical critical” approach to biblical interpretation and is based upon an “existential” attitude toward the scriptures. This interpretative theory was popularized by radical theologians like Rudolph Bultmann. It suggests that the Bible is principally the result of the formative influence of the life-situation of the early church. In other words, the New Testament is merely the record of how the primitive Christians, consistent with their subjective inclinations, adapted the broad principles of the religion of Jesus to their unique life styles. This view contends, therefore, that what was true for the first-century church may not be true for today’s church. Christianity is viewed as a rather “plastic” religion. It may alter its forms of expression to fit the mood and tempo of any given culture and historical circumstance. In 1976 Presbyterian scholar Robert C. Sproul addressed this controversy, describing the existential approach as “a new hermeneutic” (13). Does that sound familiar? Indeed! It is the identical philosophy that we are now hearing from numerous clerics who identify themselves with Christendom. “The implication of this method of interpretation for the Restoration Movement is that many proof-texts which have been used to support favorite doctrines must now be challenged as to their application for the 20th century church” (Swetmon 1989, 23). How Does Culture Influence Our Understanding of the New Testament? To what extent did the culture of the first century affect the formation of New Testament doctrine? If it does, then which elements of New Testament teaching are culturally oriented, so that from a practical vantage point they may be altered today to conform to our own unique situation? Might one assume, for instance, that the New Testament ritual of immersion in water had its roots in the Jewish ceremonial washings of the first century? Baptistries have been found in the Essene ruins at Qumran. So perhaps baptism is not an obligation in the twentieth century? And what of the communion components? May we conclude that the bread and fruit of the vine were simply cultural features associated with the Passover feast, hence, other food items may be substituted today? One of the primary motives with some professed Christians, in their quest to release the modern church from the oppressive shackles of first-century culture, is the liberation of women to assume a more dominate leadership role in the public life of the church. There is truly a feminist revolution in the making. Some are aiming for women worship-leaders, lady preachers, and yes, even female elders. Were Paul’s instructions regarding the limited sphere of woman’s public teaching role culturally oriented? This was the position argued by William Barclay relative to Paul’s instructions concerning a woman’s teaching role. The apostle declared: “But I permit not a woman to teach, nor to have dominion over a man, but to be in quietness” (1 Tim. 2:12). Of this context Barclay wrote: “This is a passage that cannot be read out of its historical context. All the things in this chapter are mere temporary regulations laid down to meet a given situation” (1960, 76, 78). One writer has asserted: “Paul could not have given women much more freedom than he did without going outside the borders of his culture” (Ink 1987, 11). How does the conscientious Bible student distinguish the options of culture from the abiding obligations of divine command? The following thoughts are submitted for careful consideration. 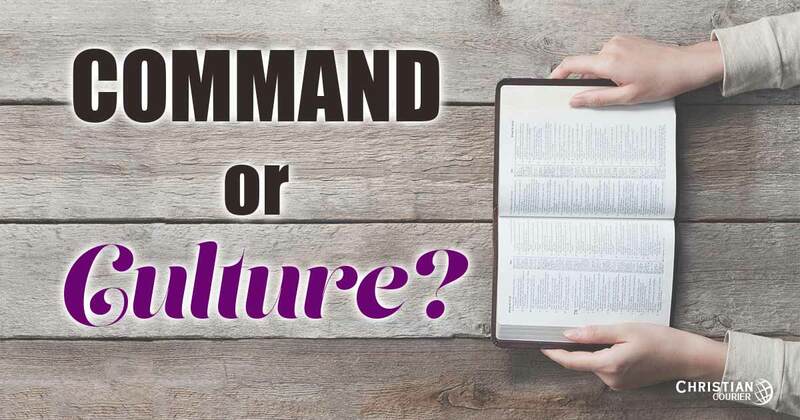 When Is a Command Limited by the Cultural or Historical Elements of the Scriptures? First, no one has the right to assume that a divinely given instruction or practice is culturally conditioned unless there are contextual considerations which clearly indicate that such is the case. For example, when Christ sent his disciples forth to proclaim the coming kingdom, he forbade them to preach to the Gentiles or Samaritans (Matthew 10:1ff). Was this to be the case always? In other words, was this cultural circumstance to persist or was it limited to the immediate events? Clearly it was limited. After the church was established, both Samaritans and Gentiles were granted the privilege of responding to the gospel (Acts 8:10). Thus, though the preaching mission of the apostles in the preparatory phase of the kingdom was culturally limited, as the Jews were being prepared for an acceptance of other peoples, such is not the case now. During his second missionary campaign when Paul came to Lystra, he had Timothy circumcised (Acts 16:3). Was this practice to persist as a divine demand or was it a culturally conditioned decision? Certain false teachers in the early church attempted to bind circumcision as a matter of religious obligation, but the doctrine was summarily rejected by men acting under the guidance of the Spirit of God (Acts 15:1, 28ff). When Judaizers demanded the circumcision of Titus, Paul refused to yield to their dictates—even for an hour (Gal. 2:3-5). The New Testament expressly states that circumcision received as a matter of attempting to achieve salvation voids the work of Christ, for in Christ the ritual is valueless (Gal. 5:2, 6). Thus, additional biblical information regarding circumcision puts the matter into clear focus. Upon what basis, though, could one argue that immersion in water was a cultural phenomenon of antiquity and therefore not binding today? There is absolutely none! First, since baptism is “for the remission of sins” (Acts 2:38) and as the need of forgiveness of sins is both universal and perpetual, it is clear that the rite is universal and perpetual, not cultural. Second, since the death, burial, and resurrection of Jesus Christ must always be the heart of the “everlasting gospel” (cf. 1 Cor. 15:1-4; Rev. 14:6), why wouldn’t the ceremony that symbolizes this historical event (cf. Rom. 6:3-4,17-18) be an abiding obligation? The New Testament Affirms Persisting Doctrine. The New Testment teaches that the basic elements of Christianity were to be age-lasting. They were not cultural influences on the religion. Consider these examples. “All authority has been given unto me in heaven and on earth. Go, therefore, and make disciples of all the nations, baptizing them into the name of the Father and of the Son and of the Holy Spirit: teaching them to observe all things whatever I commanded you and behold, I am with you always, even unto the end of the world” (Matt. 28:18-20). Within this context the Lord authorized immersion into the name of the sacred Godhead. Note that the obligation to immerse was grounded in Christ’s authority, not culture. Moreover, the promised blessing—that Jesus would remain with His people unto the end of the world—was coexistent with the responsibility to be immersed. Hence, immersion would be a divine duty until the end of the world. It was not a temporal, culturally oriented option. Are the original elements of the Lord’s supper—bread and fruit of the vine—mere relics of the Passover celebration? May we substitue modern elements more meaningful to our present generation, as some contend? Or must the ancient forms be retained? Let Paul answer: “As often as you eat this bread, and drink the cup, ye proclaim the Lord’s death till he come” (1 Cor. 11:26 — emphasis added). It is clear that the apostle intended that the bread and fruit of the vine be retained as symbols of the Savior’s body and blood until the return of Christ is accomplished! These were not optional expedients flavored by culture. The growing contention that the apostolic limitation of woman’s role in the public worship of the church was culturally imposed ignores that fact that the divine injunctions regarding male and female relationships were anchored in creation principles that relate to fundamental differences between the sexes. And these foundational truths regarding the creation transcend culture. “Whosoever shall divorce his wife, except for fornication, and shall marry another, is committing adultery: and he who marries her when she is put away is committing adultery” (Matt. 19:9). Was this ordinance an accommodation to the cultural habits of that day? May we assume that the teaching of Jesus on divorce and remarriage is not binding today so that one may capriciously divorce and remarry without limitation? Surely not. The fact is, Jewish, Greek, and Roman attitudes concerning divorce and remarriage were all exceedingly loose in that era. The Lord’s rather rigid instruction was based upon God’s design for the human family as reflected in the acts of creation at the very beginning of earth’s history (Matt. 19:4-8). Get the point, please. When a New Testament teaching is based upon the historical facts of creation, it cannot be dismissed as cultural. Similarly, in several New Testament contexts Paul affirms the concept that there is a scale of authority in the divine scheme of things. In 1 Corinthians 11:2-16; 14:33-35; and in 1 Timothy 2:8-15, the apostle sets forth three fundamental truths. First, man is the spiritual head of woman. She is to respect that position (1 Cor. 11:3,10; 14:34; 1 Tim. 2:11). Second, woman’s subordinate status is to be demonstrated by certain obligations enjoined (1 Cor. 11:5-13) and by the prohibition of participating in other activities (1 Cor. 14:34-35; 1 Tim. 2:12). Third, the theological bases of these instructions arise from the creation background (1 Cor. 11:7-12; 14:34; 1 Tim. 2:13) and from the historical introduction of sin into this world (1 Tim. 2:14). A consideration of these facts makes it clear that apostolic instructions regarding woman’s role in the church are not cultural and transitory. They are coexistent with the Christian age. “was not something which was simply forged on the spur of the moment because of the particular situation in one local church of the first century. It is grounded in facts which are not altered by geography or centuries (1958, 79). “[Paul’s] directives regarding the woman’s role in connection with public worship are based not on temporary or contemporary conditions or circumstances but on two facts that have meaning for all time, namely, the fact of creation and the fact of the entrance of sin” (1957, 109). A further evidence that the New Testament doctrine concerning woman’s role is not cultural is found in the fact that the apostles’ teaching was not merely imposed in isolated areas to accommodate fluctuating local circumstances. Rather, it was bound upon churches everywhere. The epistle to the Corinthians was not only to the saints in Corinth, but also was directed to “all that call upon the name of our Lord Jesus in every place” (1 Cor. 1:2). What he taught in Corinth, he taught in “every church” (1 Cor. 4:17). His ordinances were bound in “all the churches” (1 Cor. 7:17). With reference to woman’s submissive position: “As in all the churches of the saints, let the women keep silence in the churches” (1 Cor. 14:33-34 — emphasis added). And if any were disposed to argue against his apostolic injunctions, they were informed that their conduct was out of step with the general practice of the churches of God (1 Cor. 11:16). “[I]n both 1 Corinthians, chapter 11, and 1 Timothy, chapter 2, Paul bases his instruction upon the implications of Old Testament Law, specifically, the creation narrative. Furthermore, the Apostle gives no indication whatsoever that the principles he sets down are not binding upon all the churches” (Nicholas, 1979, 55). We must remember that when one removes a divinely stated rationale for a practice from the text of the New Testament and then injects his own assumed rationale as the basis for the instruction, he is no longer practicing exegesis. He is, instead, guilty of eisegesis (i.e., he supplants God’s Word with his own opinion). This is precisely what has been done when it is argued that Paul’s reasoning for woman’s submission is due to culture. It is argued that the early church never possessed the entire New Testament. Since a New Testament pattern could not have been required as the norm for the entire family of God in that era, the obligations set forth in the New Testament are not patterns for today. This allegation is seriously flawed for several reasons. First, it is an argument based in ignorance. we simply do not know how much revelatory information the churches of the first century had. Those early saints may have possessed many more copies of the scriptures than is assumed by some modern scholars. Also, other inspired documents other than what we possess may have been available to the early Christians (1 Cor. 5:9). Also, the early church had divinely inspired prophets and teachers who were empowered directly by the Holy Spirit to instruct the saints in faith and practice. Are we to assume that the Holy Spirit taught a different gospel through direct revelation than that which was eventually recorded for the abiding instruction of the church? What is the basis for making such an assumption? Second, even if the early church had relatively less information available, we must take into consideration the fact that God may have been more tolerant of “knowledge weaknesses” in that period of progressive revelation than He now would be when we have access to the whole New Testament in its completed format. Third, it is clear that the early saints did practice “pattern theology” (cf. Acts 2:42; Rom. 6:3-4; 17-18; 16:17; 1 Cor. 1:10). If one may adapt Christianity to his personal or cultural preferences, how could he ever “depart from the faith”? (cf. 2 Thes. 2:1ff; 1 Tim. 4:1ff). It is alleged that we must honor the “principles” which inhere in the commands of the New Testment, but that we are allowed to alter activity modes to accommodate our present situation. An analogy is commonly drawn between the “greeting kiss” of the first century (cf. Rom. 16:16) and that of modern women preachers. It is argued that if we honor the greeting “principle” today, without holding to Paul’s specific application — the “kiss” — similarly, women may still respect the principle of feminine submission while publicly teaching audiences of mixed sexes. Two things may be said in response to this quibble. First, the alleged parallel is specious. There is absolutely no evidence that the saints of the early church were ever commanded to kiss one another as a method of greeting. And I know of no scholar who has ever argued that position. Kissing, as a method of greeting, had been practiced for centuries (see Gen. 27:26; 29:13; 1 Sam. 20:41; 1 Kgs. 19:20; Matt. 26:49). The thing commanded by the New Testament writers was that the cultural practice be “holy” and in “love” (agape, i.e., in the genuine spiritual interest of another). There is not a single passage in which the greeting kiss is mentioned but what the admonition is not qualified by a modifying term (see Rom. 16:16; 1 Cor. 16:20; 2 Cor. 13:12; 1 Thess. 5:26; 1 Pet. 5:14). In view of this, one is bound to conclude that the instruction concerning the “holy kiss” is as binding today as it ever was. No Christian will ever be allowed to greet another brother or sister in lust, treachery or hypocrisy. Second, just how would one honor the principle of obedience while doing that which has been specifically forbidden, by failing to do that which has been commanded or by changing sacred instruction? That is truly a curious state of affairs. It is, in fact, nonsensical. May one uphold the “principle” of remembering the death of Christ by utilizing steak and coffee in the communion supper? There is no way to maintain the principle of obedience while one is disobeying God! There is a revolt underway in the Christian community. Many are feverishly working to throw off biblical authority and to write a new “Constitution” for the religion of Jesus Christ. It is the law of “no law.” It involves a disposition that is determined to evolve a new religion fashioned after human desire. The faithful must prepare for, and vigorously oppose this growing apostasy. Barclay, William. 1960. Letters to Timothy, Titus & Philemon. Louisville, KY: Westminster Press. Hendriksen, William. 1957. “The Pastoral Epistles.” New Testament Commentary. Grand Rapids, MI: Baker. Ink, Steve. March 15, 1987. “Another Look At Hermeneutics,” Part 3. Image. West Monroe, LA: Worldwide Missionary and Educational Foundation. Nicholas, David R. 1979. What’s A Woman To Do ... In The Church?. Scottsdale, AZ: Good Life Productions. Ryrie, C. C. 1958. The Role of Women in the Church. Chicago: Moody Press. Sproul, Robert. C. May 1976, “Controversy at Culture Gap.” Eternity. Vol. 27. Swetmon, Bill. July 1989. “The Historical Method in Hermeneutics.” Image. West Monroe, LA: Worldwide Missionary and Educational Foundation. United Presbyterian Church (U.S.A.). 2004. The Constitution of the Presbyterian Church (U.S.A.) Part I: Book of Confessions. The Office of the General Assembly: Louisville, Kentucky.